Child labor laws backed by federal legislation state that kids must be 14 to perform any type of non-agricultural job on a regular basis, including part-time. This includes any type of retail, business-related work or other gainful employment. The law protects children from being subject to unfair work practices. Children as young as 11 can perform certain delivery jobs such as carrying newspapers. Parents must supervise and monitor kids in these duties. Even though children can work at some menial tasks as young as age 11 and more challenging, organized jobs at 14, should they? This ultimately has to be a parent’s decision tempered by the facts that kids should always put schoolwork first and balance their other activities. Kids should not be so tired on weeknights that they do not feel up to doing their homework or assignments for school. School should always take precedence over work. On the other hand, taking responsibility for their own financial future to some degree and planning what they will do with the money they make has merit. It establishes parameters for kids that help them to learn time management and teaches them responsibility. So how do you decide if your child should work? Here is a good checklist to see if it would be a good idea for your child to get a job, even a part-time job while in school. Look at how your child is performing in school. Is he taking a large number of courses that will help prepare him for high school, college or the real world? If your child is busy with several course requirements, extracurricular activities and other responsibilities, it might be wise not to add a job. If he is overwhelmed, his grades may suffer. However, some kids are better than others are at balancing work with school responsibilities. Use your best judgment. Consider the financial factor. Would having a job help your child develop better sense about money and enable her to put away a little for a rainy day? If you cannot afford it, she can use money she earns as a fund to buy a car, clothes or a reserve college fund. Consider his maturity. Can he balance schedules that a job will require in addition to daily schoolwork? Will he take responsibility, show up on time and do his best? Consult with your child’s teachers and get their opinions. It always helps to hear the ideas of teachers who see and work with your child every day. They can give you a clearer picture of how your child will handle a job and school and give you an idea of how old they should be to start doing this, based on their maturity level. 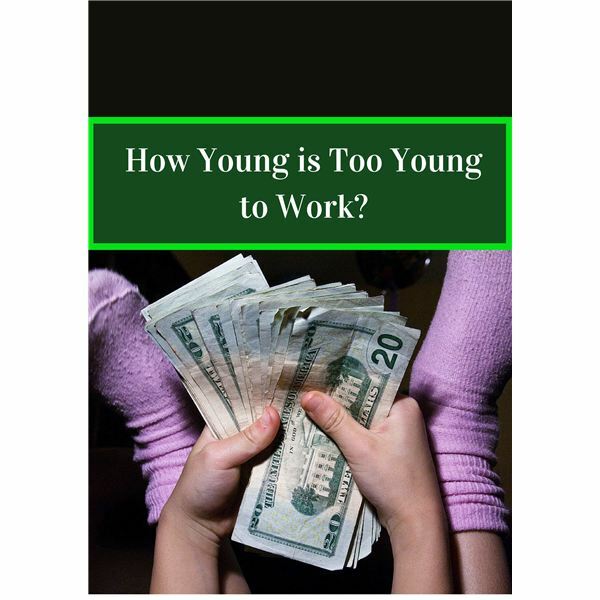 There is no definitive answer on how young is too young to work. Factors to consider include your child’s age, maturity level, course load, level of school responsibilities and how the job might help them in the long run. Talk with your child’s teachers and counselors to determine when or if your child should start a part-time job and be aware of the child labor laws. Finally, remember, it shouldn’t be about the money. If having a part-time job would give your child some good work experiences, and they will learn to better manage their time and set some real goals, which is much more important than anything money can buy!